Nyaung Shwe is the main access point to Inle Lake and the most popular place for tourists to stay. Hotels in Nyaung Shwe are cheaper than those built on Inle Lake and the township has many good restaurants and bars. Many people use bicycles as transportation to nearby spots. Cycling is made easy by Nyaung Shwe’s paved and mostly flat roads. When I visited Inle Lake, I cycled around Nyaung Shwe and went to a nearby winery at sunset after taking a boat tour on the lake on my first day. Some hotels provide free bicycles for their guests. 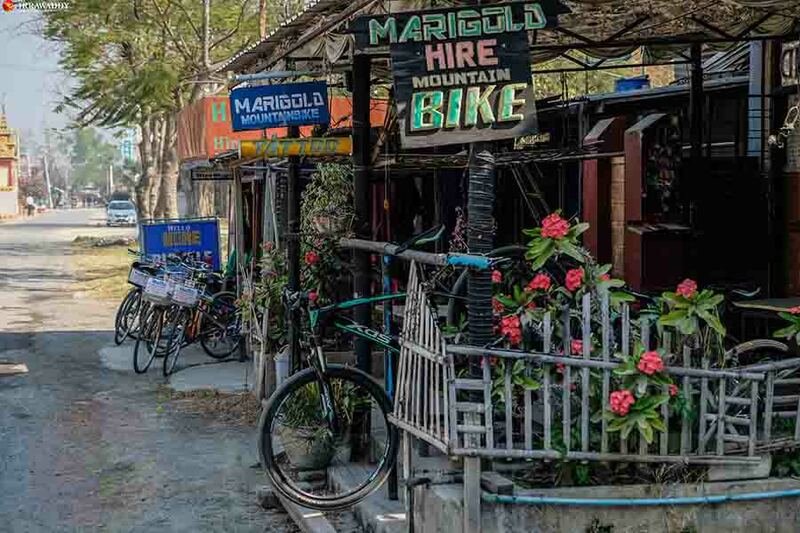 If yours doesn’t, don’t worry — there are many bike rental shops in Nyaung Shwe, with fees of 3,000 to 5,000 kyats. Myanmar has many tourist attractions, but few can be explored on a bicycle. So this is a rare opportunity and a nice way to experience the life of the local communities around Inle Lake. My friend and I left our hotel at around 3pm, with plans to cycle to two destinations: the Red Mountain Estate Winery and the Coffee House. The weather never really gets that cold, but between 11am and 3pm it’s quite hot. So the best time for biking is in the morning and after 3pm, when the sun isn’t so hot and the ride is more pleasant. 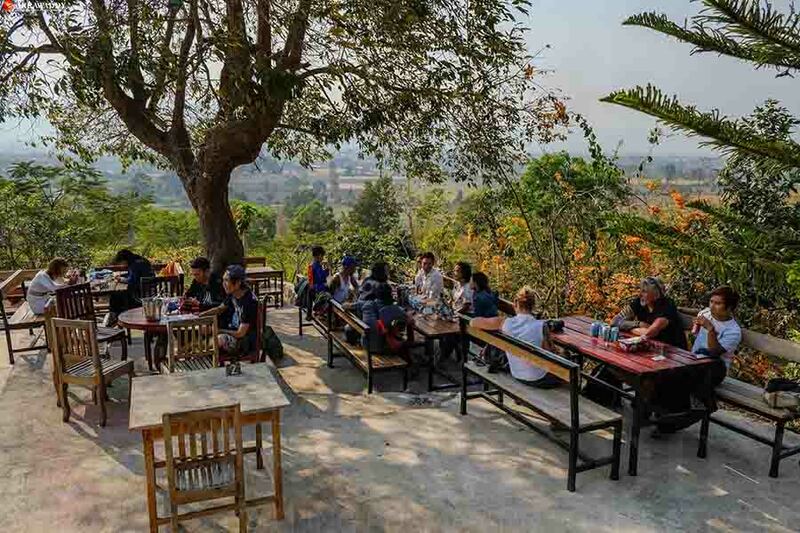 It takes about 45 minutes to get the Red Mountain Winery from Nyaung Shwe; all you need to bring is water and a camera. On the way, you can stop at some interesting places to take photographs and the road is really nice, with a lovely view. Very soon, we reached the sign for the winery and turned left onto the entrance road. This is a fairly long, dusty stretch of road. We found ourselves on a plateau facing a mountain. It was too steep to ride up so we got off and pushed our bikes all the way to the entrance. We passed the vineyard and came across more beautiful scenery. The winery has two main buildings; one is for wine tasting and the other is a restaurant where you can order wine and snacks. The outdoor area is the best place from which to take in the sunset. 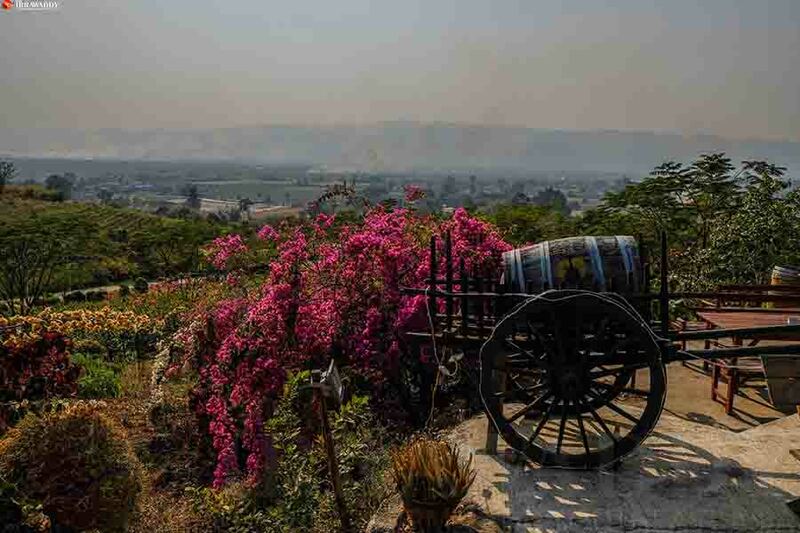 At our backs was pretty Shan Hill, and before us was the panoramic view across the vineyard to Inle Lake. It was a pretty cool sight. 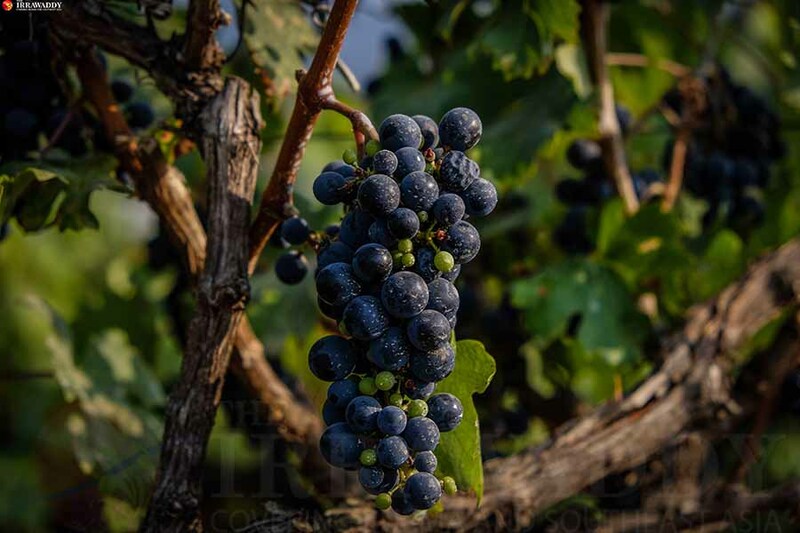 Red Mountain’s wines are made from their locally grown grapes. Wine tasting is 5,000 kyats until 6pm, including 4 glasses of red and/or white wine. While the wine was too dry for my taste — maybe I just picked the wrong one to taste — the visit was still worth it, as we spent time wandering around the vineyard and watching the sunset amid beautiful surroundings. Sunset is the best time to go, but the winery does get a little crowded at this time. So, when visiting Inle, Red Mountain is a must-see place for a beautiful sunset moment. However, we didn’t have enough time to watch the sun go down. 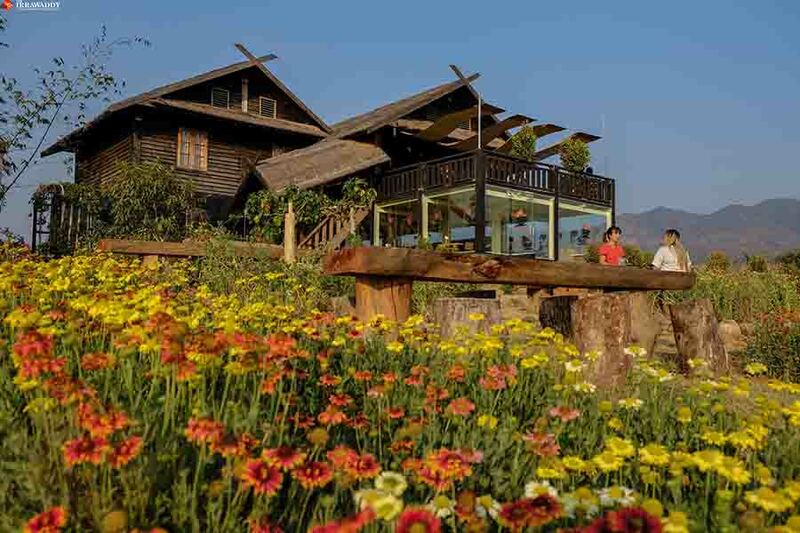 Leaving the winery, we continued on to the Coffee House by Pleasant Garden near the Inle Horse Club. It takes about 45 minutes to get there from Red Mountain Winery. We were hot and sweaty by the time we got there, but riding turned the journey into an adventure. After another long and dusty ride, we reached the entrance of the coffee shop. This nice, quiet, private coffee house is built in the middle of a garden. Even that area is dusty; we chose to sit outside and ordered a couple of strawberry juices and snacks. Its nice to sit and drink a juice, with the view of nature and the mountains, which never fail to relax me. The scenery is stunning — the juice is good, too. Sunset is just as beautiful from this place, but this shop is less crowded as it’s less well known and a little harder to reach than Red Mountain. It was getting dark and our bicycling tour was over. We headed back to Nyaung Shwe, which only took 30 minutes. When you’re visiting Inle, this bike tour around Nyaung Shwe is a must, after you’ve done a boat trip on the lake. I’m sure you won’t regret it.